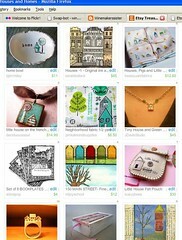 A few days ago I set up this Etsy treasury. Of course, the theme is Houses and Homes (as you can tell by the photo and my title). I love all the little home-themed art. The good news is that the treasury made it to the front page.... and the bad news is that I missed it. I only know it happened because of the comments -- people congratulating me for making it on to the front page. Ah, well. It's nice to know that the Etsy folks liked it enough to highlight it. I so saw this!! It was beautiful! And your pics were great! !